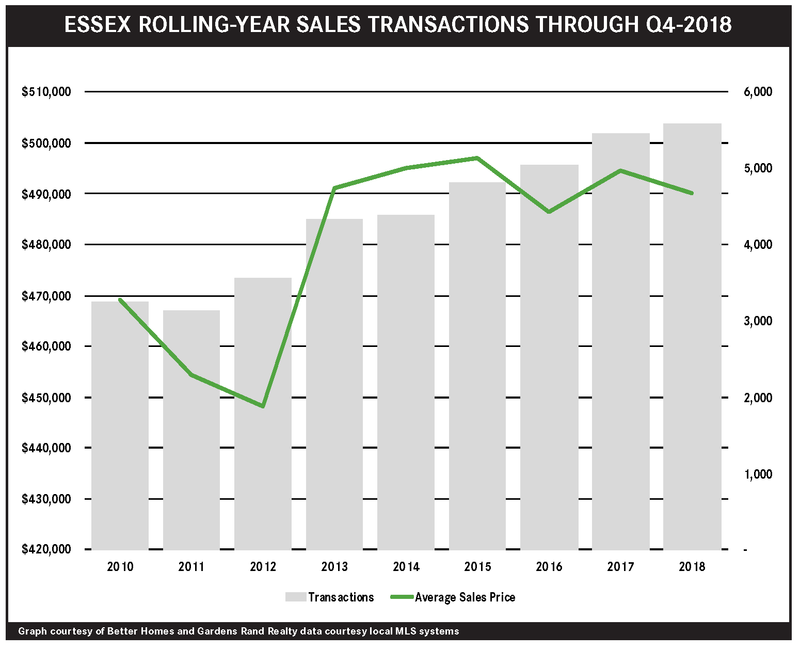 Sales in the Essex housing market went up again in the fourth quarter, but this increase in buyer demand had a middling effect on pricing. Sales rose almost 4% for the quarter, and finished the year up over 2%. But pricing was mixed: for the quarter, the average price was down over 4%, even while the median was up a tick. We saw the same thing for the full‑year results, with the average down slightly and the median up about 2%. The negotiability indicators, though, continue to support the idea that we’re in a seller’s market: homes are selling more quickly, and for very close to the asking price. And inventory continues to stay well below the six‑month level that usually denotes a seller’s market. Going forward, we do believe that prices have room for growth, and that rising prices will eventually attract more sellers, and more inventory, into the market.